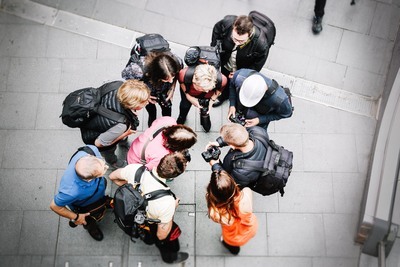 The Manchester Photography Group is a regular, fortnightly social gathering for people who share a passion for photography and want to practise their skills. It gives you the chance to meet up with other photographers, trade tips and build friendships. Beginners are welcome. Each two hour class will focus on one theme or particular aspect of photography, in a different location each fortnight. A professional photographer will also be there to help answer questions and offer advice on the day. Groups larger than 12 will have multiple instructors. Your experience doesn’t stop once the class ends - you can also share your photos with your peers in the Manchester Photography Facebook Group and enter our fortnightly themed competitions to have chances to win great photography prizes. Brilliant. Really good to learn off others and be set specific briefs. Nice group size too. Adam was very helpful in showing me how to choose the right settings and incredibly patient as I tried to get my head round all the options. Great weather, location and tutor. Made better by the film set in the Northern Quarter. Good Event and at last some decent weather which worked for the occasion. Adam as always was engaging and helpful. Good group and good engagement. Tasks set were simple. Ideas inspired by fellow photographers. Good Event - the only unfortunate thing was the weather but we all persevered. Good group of people. Adam was always on hand to show, advise and extend photo techniques. Adam was very engaging and inclusive. Can't wait for the next workshop! It was informative and enjoyable. Good Workshop event. Everybody socialised very quickly and listened to what Adam had to say. Adam very helpful in providing confidence and useful photo shot tips. Would like to get more involved in more Workshop Groups. It was really good. Personally, it was the first time for me to attend to this type of events and enjoined it a lot. The event is good and Adam is very helpful indeed. It is a good way to meet up with people that have a passion for photography. Fully enjoyed this and picked up some useful tips. Looking forward to the next one. Friendly group, clear sound support from Adam who is very encouraging and gives positive guidance. A fantastic morning spent in good company and great advice from Adam Astley. Really enjoyed the morning, nice group of people. Adam the instructor was very good and helpful. Great instructor. Stimulated creative juices in awful weather conditions. Grey and wet. The challenges were fun and helped structure the session. The 2 hours flew by! It was a friendly group and the tutor was excellent with good teaching skills and camera knowledge. Not too many people in group. Easy to understand tasks. Felt accomplished and enjoyed. It was my first event and I appreciated it because I could get together with other fellows photographer, socialise and exchange tips and knowledge. Great casual event in an interesting location Jo was incredibly friendly and patient with the group.